A lich that accrues enough power over its newfound immortal lifespan becomes one who can stain souls with despair and sow ruin across the world. 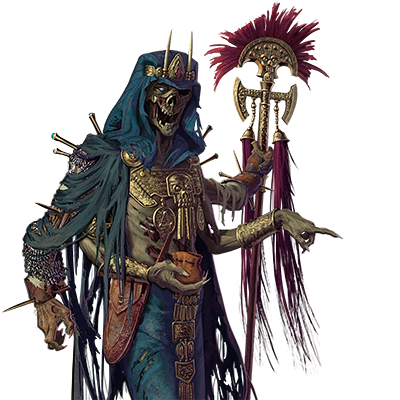 Invariably in command of a nigh-limitless horde of risen warriors and undead monsters, a lich of this order has a mastery of dark sorcery that can bring dread to the most storied magi of human and elven kind. Such a figure usually marks a dark and bloody chapter in history, and in those times of need, it is only through the tireless efforts of the most valiant heroes that the rise of an Ancient Lich has not led to the shadows ruling the world for the rest of time. Specialaj notoj: This unit has magical attacks, which always have a high chance of hitting an opponent. During battle, this unit can drain life from victims to renew its own health. This unit’s arcane attack deals tremendous damage to magical creatures, and even some to mundane creatures. This unit can move unseen in deep water, requiring no air from the surface.